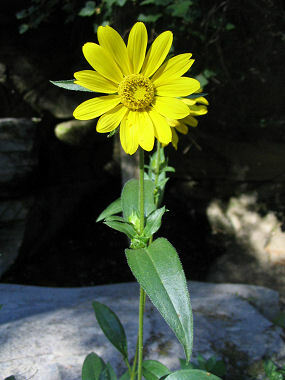 Aspen Sunflower is a member of the Sunflower Family. The plant grows to 5 feet in height and has grayish green, wide, lance shaped leaves that grow to 10 inches in length. The plant typically grows in meadows and clearings in pine forests at elevations between 5000 - 10000 feet. Flowerheads of the Aspen Sunflower are grazed by wildlife. Aspen Sunflower blooms between July - October and produces a 3" yellow sunflower.